In the decades following the collapse of state socialism at the end of 1980s, disabled people in Central and Eastern Europe endured economic marginalisation, cultural devaluation and political disempowerment. Some of the mechanisms producing these injustices were inherited from state socialism, while others emerged with postsocialist neoliberalisation. State socialism promised social security guaranteed by the public, and postsocialist neoliberalisation promised independent living underpinned by the market. This book argues that both promises failed as far as disabled people were concerned, drawing on a wide range of scholarly reports and analyses, policy documents, legislation, and historical accounts, as well as on disability studies and social justice theory. Besides differences, the book also illuminates continuities between state socialism and postsocialist capitalism, providing on this basis a more general and historically grounded critique of contemporary neoliberalisation and its impact on individual and collective life. 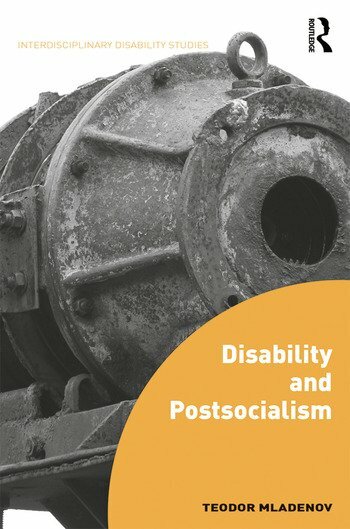 The book will appeal to anyone interested in disability studies and postsocialism, as well as social policy, social movements and critical theory. It will also be of interest to professionals involved in disability-related service provision, as well as to disability activists and policy makers. Teodor Mladenov is currently Marie Curie Individual Fellow at the European Network on Independent Living, and was formerly Leverhulme Early Career Fellow at the Centre for Public Policy Research, King’s College London. He is author of Critical Theory and Disability: A Phenomenological Approach (2015, Bloomsbury). In the period 2000–2009, Teodor was actively involved in disabled people’s advocacy for equality and emancipation in Bulgaria.